Looks like the iPad isn’t the only tablet in town when it comes to magazines. 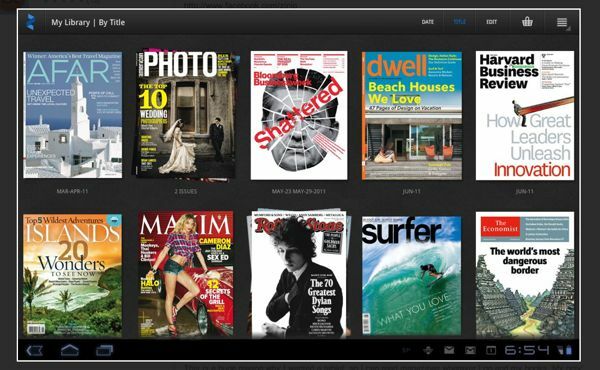 Zinio, which has been offering digital magazines to the online masses for years now, finally released its long-awaited e-reader app for Android-powered tablets like the Motorola Zoom and the Samsung Galaxy Tab. Subscriptions and single issues from the likes of National Geographic, Rolling Stone, Esquire, Maxim, The Economist, and Elle are available—provided you’d got a tablet running on version 3.0 (“Honeycomb”) of the Android OS. Join our mailing list to receive our latest tips and how-tos. Thank you! Please check your e-mail inbox for an opt-in confirmation. Get free tips, how-tos and deals from here’s the thing delivered straight to your inbox each week. Thanks! To confirm your subscription, please click the link we just sent to your mail inbox.